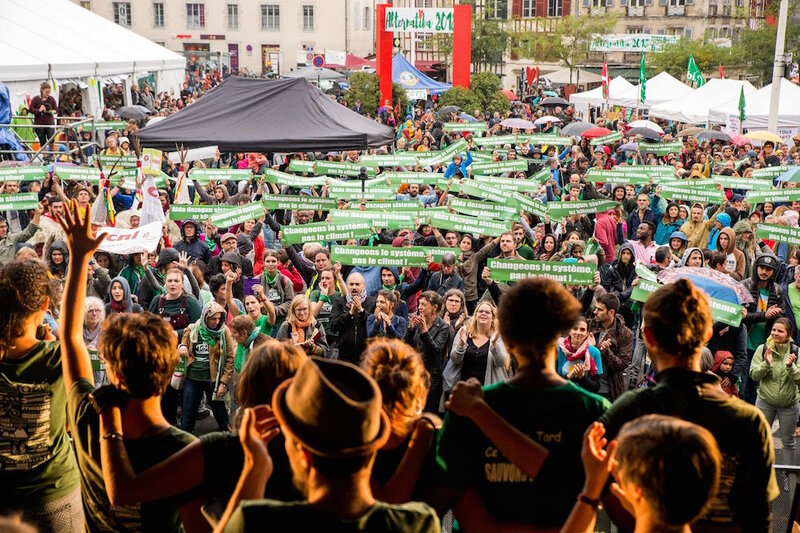 Bayonne, October 7th – Over 15 000 people gathered in Bayonne for an important mobilisation for the climate. 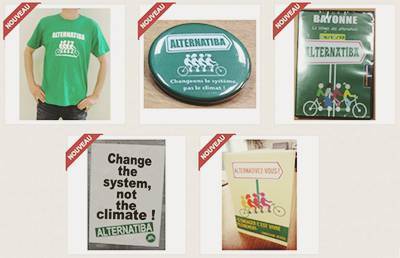 Over the weekend many events met with popular enthusiasm: arrival of Alternatiba Tour, a huge village of alternatives, tens of conferences held by prominent speakers. On Sunday, a vibrant reading of appeals to implement the radical changes needed in our territories ended this great popular festival. The village is just closing and we can call it a success. Around 30 000 people came from all over France but also from Spain, Belgium, Switzerland, Senegal. Among this crowd were 200 prominent personalities, scientists, elected members, heads of organisations, artists or former state ministers. Valérie Masson-Delmonte, member of IPCC, spoke live from South Korea on Saturday to announce the adoption of the 1,5 °C report. On the eve of the release of IPCC 1,5°C report, Bayonne sent out a message loud and clear. The final appeal was read by Gaby, a young high-school student from Poitiers and Moriba, a teenager from Guinea who crossed the Mediterranean on an inflatable dinghy and was saved from drowning by a rescue team at sea. They are both sixteen years old and they sent out a vibrant appeal for an immediate metamorphosis of our territories. “Far from small steps policies and faced with the absolute necessity of containing temperature rise around the globe below a critical 1,5°C threshold, it is crucial that we start this ecological and social metamorphosis in our territories right now: it is our responsibility that, from today, we implement those actions that will help us reach our goal and also, to take our local elected representatives along with us on this path and be there to hold accountability.” says Pauline Boyer from Alternatiba. Among the great crowds on the Alternatiba village squares six banners in six different languages, French, English, Spanish, Euskara (Basque), Arabe, Chinese, reminded us all “1,5°C, there is still time. Change the system, not the Climate”. They reminded us the necessary step to bring about a more ethical and sustainable world. “1,5°C is vital and urgent for millions of people already feeling full brunt the consequences of climate change. This is especially so in Southern countries where the human and social cost is huge for a disaster they did not contribute to bring about. There is still a small window available to contain temperature rise around the globe below 1,5°C, but this means we need to implement immediate and dramatic changes to our system as well as oppose dubious solutions such as weather modification or nuclear power.” says Florent Compain from Amis de la Terre. The final meeting ended with Vincent Verzat from “Il est encore temps” platform. He called to unity over the coming landmarks: IPCC’s presentation of their report’s key conclusions to political leaders, a march for the climate on October 13th and other actions with the red hand symbol against policies and project endangering the climate. “The red alarm is on: we will have zero tolerance from now on. Increasing numbers of citizens are ready to take part in non-violent action and they no longer hesitate to use civil disobedience to stop climate disrupting projects and policies. We will continue to fuel this movement in the coming events, among which Société Générale’s great clean up against dirty energy in Paris on December 14th“ said Jon Palais from Action Non-Violente COP21. This prospect is very real when we witness the massive presence of people from all places in Bayonne, walking about hundreds of stands, showings, presentations of realistic alternatives, exhibitors, conferences that display the wide range of realistic solutions available to contain climate change. This weekend’s thriving citizen gathering mirrors the atmosphere met on the other alternative villages over the 4 months long Alternatiba Tour where 77 000 people came determined to take action and change things for real. With 50 conferences over fundamental issues such as this government’s climate balance and energetic transition policy, obstacles to transition, relocating our economy here, financing transition policies, transports, sustainable energy, solidarity and climate justice, this weekend has contributed to the search for solutions. Actual alternatives, such as Enercoop’s 100% sustainable local energy supply or the eusko, a local currency that reached 1 million eusko this weekend and is the largest local currency in cash in Europe, are demonstrating these alternatives are ready to upgrade. Alternatiba2018 may look like a great popular festival, but they have once again demonstrated that the fight against climate change is not just a challenge tens of thousand people are ready to raise to but also, it is the bedrock for more appealing and sustainable societies.